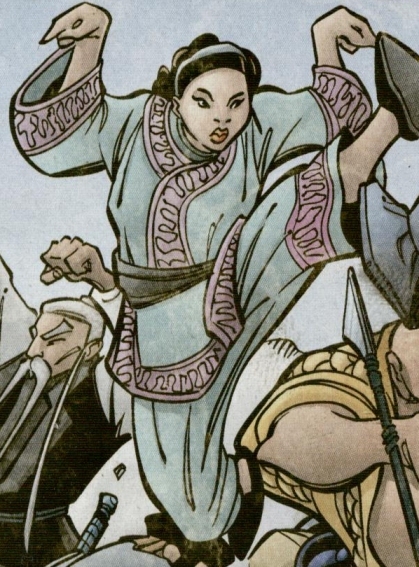 One such heroine is Ng Mui (Chinese Traditional: 五枚; Cantonese: Ng Mui; Mandarin: Wú Méi). According to legend, Ng Mui was born into a noble family as the daughter of a Ming general within the imperial court. Her social standing gave her access to the finest education and martial arts instruction of her time. 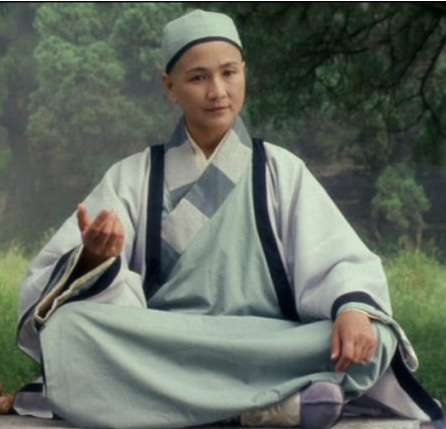 She was regarded as a master of Shaolin martial arts (少林拳), Wudang martial arts (武当拳), and a style of Yuejiaquan (岳家拳) founded by the Song dynasty general Yue Fei and distinct from the Northern Shaolin Yue Chia style developed by the Henan Shaolin Temple in northern China. Ng Mui was credited with founding several styles, including Wing Chun (咏春拳), Ng Mui style (吴梅派), Dragon Style (龙形摩桥), White Crane (白鹤派), and Five Pattern Style (五形洪拳). She is named in many folk tales, which contradict each other. In the Wu Mei Pai tradition, Ng Mui created her style while in the Forbidden City. She practiced on capsized logs with a stance she developed to cultivate balance and leg strength. She was traveling when her parents perished during the Manchu (Qing) conquest of the Ming capital city. She fled to the White Crane Temple in Kwangsi province (according to this legend), becoming an anti-Qing rebel and teaching her style within the temple. Her style included rapid counters and slower movements from Qigong and Bodhidharma forms. Dragon style historians say that Ng Mui created the Dragon style at the Henan Shaolin Temple about 1565. She was one of the last members of that temple before its first destruction in 1570. In the lore of Tibetan White Crane, though, Ng Mui is the Chinese name of a male Tibetan monk called Jikboloktot. He was of the last generation of students taught by Sing Lung, a martial arts master who sheltered at the Dinghu Temple in Guandong (modern Canton) during 1865. According to Five-Pattern (Five-Animal) stylists, their style was jointly created by the nun Ng Mui and Miu Hin, an unshaved monk from the Siu Lam monastery. The two masters observed and imitated the movements of many animals, adapting the techniques for human limbs. The shortest and fastest distance between two points is a straight line. The essentialness of control and striking along the centerline (the plane between the center of one’s body and that of an opponent’s). Executing 2-3 techniques simultaneously rather than one. Receiving what arrives, following what retreats, and striking when open. Yim Wing Chun defeated the bandit and wedded her promised husband Leung Bok Chow. She taught Ng Mui’s system to her husband, who named the system after her. Little to no resemblance exists for the styles Ng Mui is associated with. Her contributions to each style show a development in her skills. As she set her own path in life, Ng Mui helped shape Chinese history and contributed to China’s tradition of female martial artists. Both men and women can learn the practical techniques and culture of the Shaolin monks and nuns in Detroit and Madison Heights classes offered by the Michigan Shaolin Wugong Temple.